With the formal continuation of the US Military’s “Don’t ask, Don’t tell” guidance to homosexuals who wish to risk their lives for a country that doesn’t want them to exist, senior figures in the Pentagon are planning to extend the policy to other areas. The new approach will mean that if you are spying for the Kremlin then as long as you don’t tell anyone no one will ask and you can continue your career as an archivist at NORAD headquarters. Whilst “Don’t Ask, Don’t Tell” is most commonly thought of as solely being a means of curbing gay servicemen’s desire to run into battle with the arse cut out of their uniform, Russian spies are only the latest unwanted group within the Army to which it has been extended. The other group to benefit from the new approach will be Al Qaeda operatives who are currently serving in the US military as sleeper cell members. 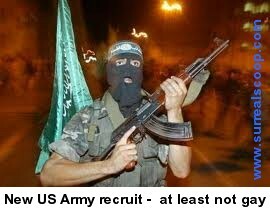 With the new policy the US military will finally be able to equalise terrorist murder, treason and being gay.